Reverse osmosis membrane elements are used to purify water for drinking, provide spot-free rinse water, purify water for laboratory uses and for dialysis, and other applications where low mineral content water is desired. When used in systems producing up to 2 m3/hr (10 gpm), these are considered commercial applications. Filmtec offers a wide range of commercial / industrial membrane elements to meet the needs of these varied applications. 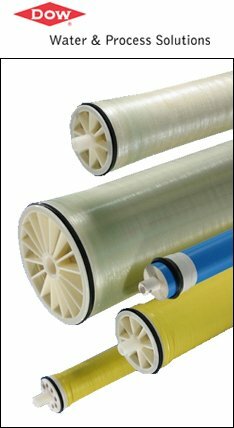 Filmtec products are differentiated primarily based on membrane performance and element size. From products delivering the highest quality water (BW30, TW30) to the lowest pressure RO element (XLE) to a combination of low energy and high solute rejection (LP, BW30LE), there is a Filmtec RO element for nearly every system. When choosing between elements with or without a fiberglass outer shell, please consider that the membrane and element performance is the same between the two different element types. Due to structural strength, fiberglassed elements are recommended for systems with three or more elements in a single housing. Taped elements are recommended for systems with one or two elements per housing. Car Washes: Excess minerals cause spotting on freshly washed cars. RO is used to produce spot-free rinse water. Restaurants: RO purified water improves the taste of drinking water, ice, and other beverages, eliminates scaling of steam tables, and provides spot-free rinse water. Water Vending: Both water vending machines and bottling plants use RO to produce safe, healthy, good-tasting water. Marine: Oceangoing boats and yachts purify seawater with RO to produce drinking water. Dialysis: Hospitals, dialysis clinics and in-home dialysis machines require high quality dialysate water. RO is widely used to produce the required quality water. Laboratories: High purity water is used for sample preparation, rinsing glassware, and other lab uses. Note: Permeate flow rates for individual elements may vary +/-20%, and will also be influenced by feed water conditions.